W12 mission is to minimize risks and increase the profitability of investing in projects at the initial stage globally. 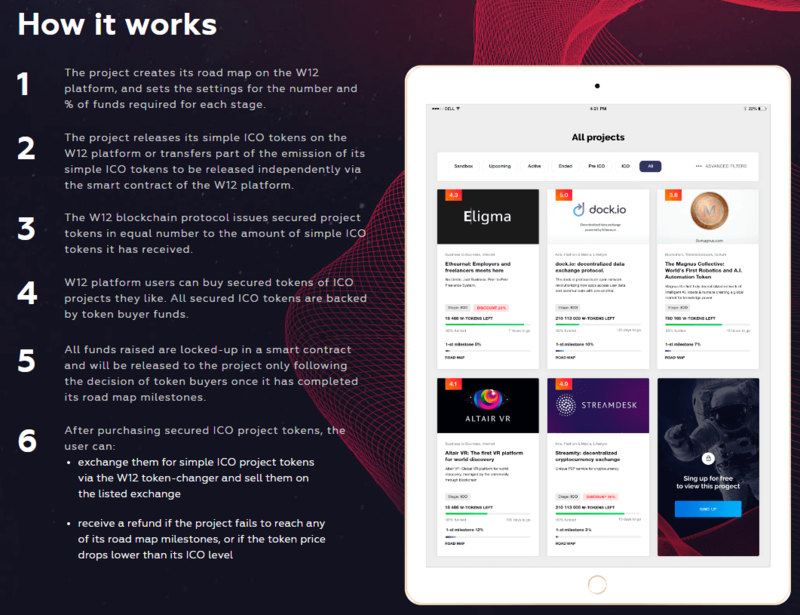 In its turn, the W12 platform provides projects with the opportunity of raising funds at no costs and without special technical expertise by creating an environment for projects in which the path from an idea to a profitable business would be as short as possible. Enhances early-stage project investment yield more than tenfold through the purchase of tokens and reduces risks for investors. 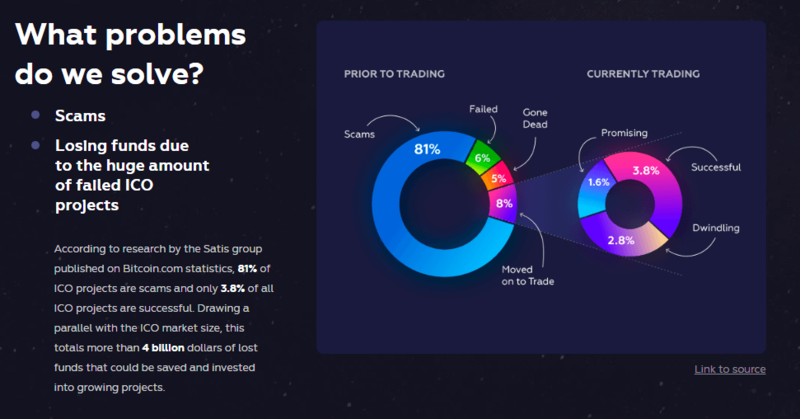 Refunds up to 95% of funds invested in unrealized project to investors. Provides the possibility of limiting the sale of tokens by early-stage investors on exchanges immediately after an ICO to prevent token price drops (when the project activates the Token Hold function). Simplifies the private investors’ choice of projects and the transfer of funds to trust management professionals. Allows projects to quickly attract financing without initial costs or any special technical expertise. Creates infrastructure for the decentralization of capital and establishes a new standard for safe investment in projects. 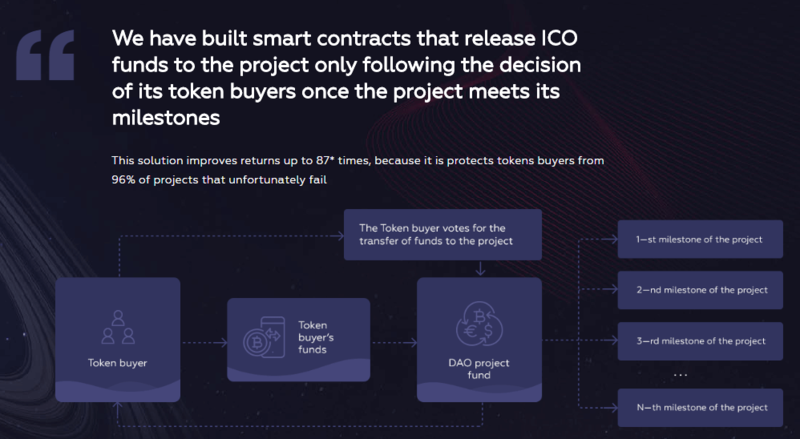 – Facilitates smart contract execution. One of the most vibrant applications of blockchain technology was the creation of cryptocurrencies, for example, Bitcoin. Attempts to create non-state currencies were long before the advent of the blockchain technology, but they had an issuer and the need to trust it the funds; hence, they were not widely used. – all transfers are recorded in an open registry, and everyone can see the flow of the funds. The model for attracting financing through the ICO was invented by developers who needed resources to create cryptocurrencies. They sold a part of not yet created cryptocurrency to a wide range of persons and spent the collected funds on further development. In terms of attracting a large number of investors, it was reminiscent of an IPO (Initial Public Offering), hence the name. Typically, the emission of tokens is limited and they are “tied” to one of the project parameters (for example, profits). As this parameter value grows, so does the value of the token, thus making it attractive to investors. At the moment, any business has the technical capacity for issuing its own tokens for the purpose of decentralizing the raising of a large number of investors’ funds, and the rights to any asset can be tokenized. All this opens up new avenues for the development of the digital economy. Head of ICO projects department. Customer development, market research and project development. Team meeting. Platform architecture development. Terms of Reference development and starting the marketplace development. The alpha version of the W12 marketplace. Terms of Reference development and the W12 blockchain protocol prototype development. +100 projects will be added to the W12 marketplace. Creation of project rating system. Creation of token buyer training scheme. Creation of landing page for implementing the W12 crowdsale. Company registration in Singapore. Start creating the project community. Registering the W12 token buyers as White List participants. Launching advertising and PR campaigns of marketplace and W12 token sale. Implementing the Pre-sale of W12 tokens. Development of the W12 blockchain protocol for issuance and sale of project tokens (with a phased disbursement of funds): smart card templates for issuing tokens by projects. DAO project fund with the possibility of voting by the token buyers. web interface on W12 marketplace for projects to fill in the parameters of their crowdsale. confirmation blockchain transations service (ETH, LTC, BCH, ETC, ADA, XLM). Testing of W12 marketplace. Start of assigning a project rating by the platform users. Adding new features to the marketplace (Sandbox functionality, services and experts sections, bounty cabinet, further development of the Personal office). Creation and A/B testing of high-converting landing pages for token buyers and project registration on the platform. Adding at least 300 projects to the marketplace. Launching and conducting W12 crowdsale. Listing the tokens on exchanges. 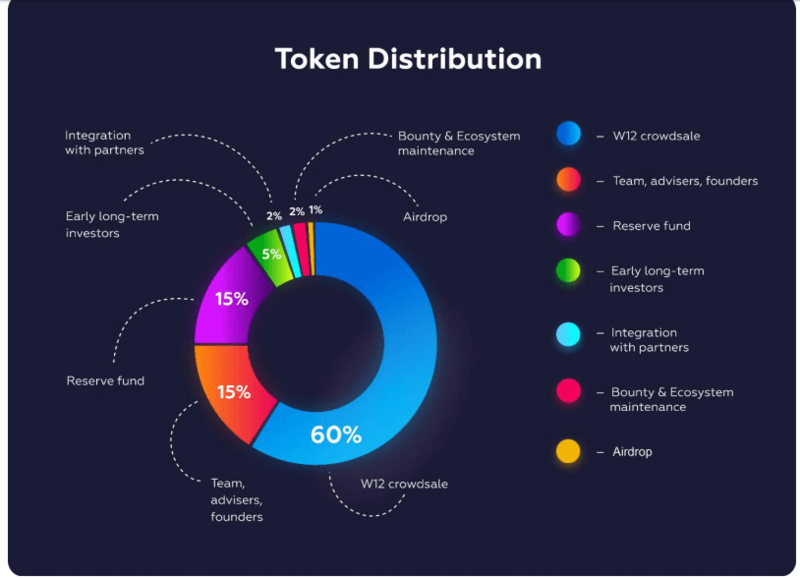 The W12 protocol additional features development: for selling tokens issued by projects outside the platform. adding more cryptocurrencies to be used to buy project tokens. automation tool to deploy smart contracts for the Ethereum blockchain. Testing of the W12 blockchain protocol. Audit of the W12 blockchain protocol. Audit of the W12 platform security system. Developing additional functionality of W12 marketplace, adding pay services for projects. Start of developing mobile marketplace application on Android and iOS. Launching the beta version of W12 marketplace. Advertising and PR campaigns of W12 marketplace. Architecture development and Terms of Reference development for an exchange. Partner agreements with private experts and rating agencies for scoring the platform projects. Launching the development of an exchange to provide liquidity and free token listing for the projects having completed the ICO on the W12 platform. The first version of mobile marketplace application on Android and iOS. Launching a fully functional W12 blockchain protocol. Launching a service for buying ETH for fiat currencies (to further buy project tokens for ETH). Advertising and PR campaigns of marketplace and mobile application. Organization of the series of conferences and events all over the world to attract token buyers and projects. Adding at least 300 projects to the marketplace. Launching a service for buying major cryptocurrencies for fiat currencies. Ongoing development of the exchange and PAMM accounts, adding new functions to the marketplace and the mobile application.o Launching a scoring system providing the expert’s voting power being determined by the results of his projections and the real increase in the price of the token. Testing of mobile W12 marketplace applications. Mobile application security audit. Release of a full-featured mobile marketplace application. Signing partner agreements with cryptocurrency exchanges. Advertising and PR campaigns of marketplace and mobile application. Launching own exchange and platform for creating PAMM accounts (transfer of funds to trust management).